Doug Beattie MC, bestselling author of An Ordinary Soldier, Task Force Helmand and Reaper. Frank Ledwidge, bestselling author of Losing Small Wars and Investment in Blood. SOLDIER, the official magazine of the British Army, awards SPIN ZHIRA five stars. ‘Chris Green’s skilfully written story is immediately and continually engaging as he takes you on his personal journey; re-entering service in the British Army as a relatively old man, 15 years after resigning his first commission. From a failing marriage and a successful but unfulfilling career Chris’ desire for adventure takes him to the top of beautiful mountains to ski fresh powder and to the bottom of human existence fighting a war against insurgents in the heat of Helmand Province. Along the way experiencing the emotional reality of perhaps never seeing his two boys again, the fear of not being fit and able enough to get back to the front line and the utter frustration of seeing stupid decisions from our governing classes adversely effecting the lives of Chris fellow soldiers and the Afghan people they were there to help. Ultimately Chris Green’s personal journey has resulted in an amazing achievement, the publication of a book which seems to have nothing but positive reviews. Personally I found it a brilliant read; intelligent, interesting, exciting, insightful, darkly funny and often tragic, I think Spin Zhira should be read by anyone from the Government, the civil service or the armed forces who are making policy decisions, strategy decisions or logistical planning decisions with regards to British or Nato involvement in Afghanistan. Indeed the government should appoint Chris Green to help shape policy and strategy for Afghanistan. Spin Zhira shows that its author understands the country better than most; the people, the history and the complexity of the situation which has seen the Afghan people suffer continually at the hands of invaders, insurgents, enemies, supposed friends and one another. JUST A REALLY GOOD BOOK. NO CATCHY PHRASES OR SLOGANS REQUIRED. ‘Spin Zhira tells the story of Chris Green’s service in Afghanistan. It is a gripping account about the people Green encountered during his time and his skilful prose and eloquence bring the reader right into the narrative. He gives a refreshingly honest account of the strategic mismanagement of the campaign and the frustrations he endured in trying to do the job the Army sent him to do in Helmand. Green pulls no punches in the way he has written this book. Against the background of his preparation to deploy he describes in detail the disintegration of his marriage and his relationship with his two sons. In this sense it is a deeply personal account of more than just one man’s military campaign and for this it is an even more powerful story. Brilliantly written and humblingly honest, Spin Zhira is arguably one of the best books I have read in a long time. If you are going to buy any book about what it was like to operate in Afghanistan, Spin Zhira is it. ‘A riveting, frank, on-the-ground account of the Afghan conflict and the role of the British Armed Forces. This very personal account feels honest and real, offering a very different perspective from the mainstream, stylised war story fayre. Spin Zhira documents the journey of a middle aged man attending to his own personal crisis by seeking out the purity of the warrior life. In heart-rendingly clear prose he takes us with him through the hope, shock and disillusionment of his journey. In this groundbreaking book Chris Green lays bare the inept group-think that typifies UK Defence policy in the 21st Century. Under-resourced, with no clear objective and even less understanding of the history, people and culture of Afghanistan, the brigade of which Chris is a member is a microcosm of western military impotence in the face of an implacable and wily enemy among an (at best) indifferent and (often) hostile population. We see through Chris’s eyes the wishful thinking of the NATO forces who can’t acknowledge the Sysiphean nature of their task, the perversity of metric-driven ‘progress’ that won’t seem out of place to students of Vietnam and the utter futility – obvious to the long-suffering Afghans – of the whole damn thing as a result. The story of his deployment is played out against the background of despair at an imploding marriage and his desperate attempts to maintain meaningful contact with his much-loved children, and this provides a stark counterpoint to his experiences in Afghanistan – laying bare the conflict between man as soldier and man as father. ‘Chris does a fantastic job with his compelling portrayal of the comradeship, intensity, and ultimate futility of the the third (or is it fourth?) Anglo-Afghan war. Told in his typically self-deprecating style, he has a wonderful way of brushing past his achievements and abilities, distracting the reader with his (few) mishaps whilst focusing the reader on the strengths of others around him. This brings the book alive for me. Knowing Chris from the training for his Afghanistan deployment, I only saw the confidence and clarity that he showed, rather than the vulnerabilities that he reveals in this book. ‘A real page turner, one that had me reading consistently way too late into the night. A very soul bearing account of rejoining the army as a middle aged man. There are plenty of narratives written that portray military campaigns as a successful application of doctrine & tactics; also many more about leadership lessons learned in combat situations. This is neither of those, it’s a gritty and honest account of one man’s experience that doesn’t pull any punches. The wisdom of experience shows through in his thoughts & self confidence (to question / challenge the party line). ‘Experience and passion over material goods and possessions. Almost none of us have the courage to live our life fully. This book provides an insight into the extraordinary courage and resilience of the Army operating in a misguided if well intentioned war, battling cultural differences and then rotating out at the end of each tour just as they have learnt enough to be useful. A GREAT READ BY ANYONE’S LITERARY STANDARDS. As someone who volunteered to join a previous War with the Grenadier Guards, this book was intriguing to me. The fact that it was recommended to me by one of the characters within the pages and the fact that I personally know some of the others, marked it out as a ‘Must read’. What the author has achieved with this book, is to highlight – often hilariously, sometimes with great pathos and occasionally with sadness and frustration – the reality of a war without real objectives. When I say that I’m not – in anyway – trying to diminish what the lads out there were trying to achieve on a local level. It was often a cobbled together ad-hoc operation and latterly (it seems), it was reactionary, rather than proactive. Lacking the coherent strategies usually found in a “Go to war, kill the enemy, come home for tea and medals” kind of operation. Almost like a deadlier and dustier version of Northern Ireland. The author, who is better placed than most to understand the bigger picture of the sometimes seemingly pointless Patrols/actions, highlights his own personal frustrations without ever succumbing to despair (well almost). His sense of humour was quite clearly high on his packing list and it’s presence is always welcome in the darker pages of the book. A tale of a successful Man, frustrated by life’s limitations? A tale of a Warrior, seeking a last – defining – battle? A tale of a weak government, sending soldiers into war without a clear objective? A great book, enormously informative and equally funny, poignant & real. Look forward to the next installment of your journey Sir. 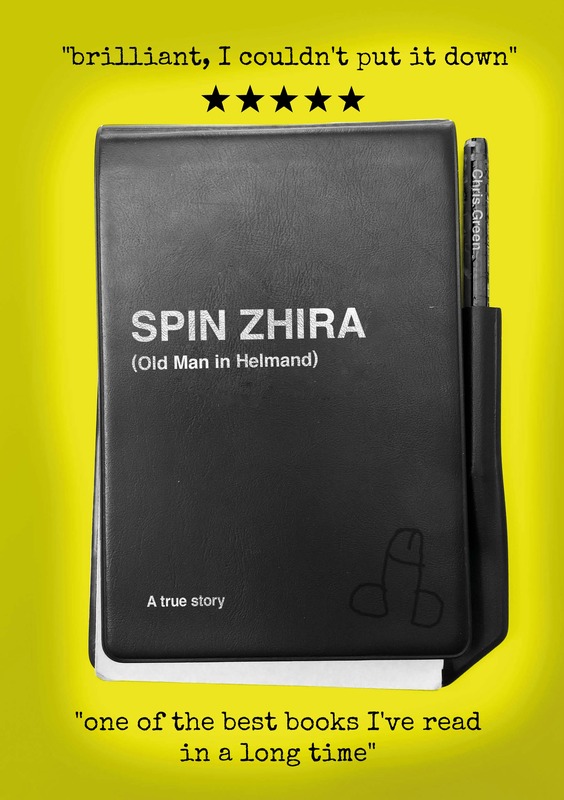 ‘Spin Zhira is a honest and accurate account of Chris’ operational deployment to Afghanistan where he had a unique role which saw him engaging with a vast array of characters from NATO generals through to local shop keepers. His personal reflections have captured the smells, noise, heat and tension from one of the most dangerous districts on the planet; the prose has recalled many personal experiences I have from the same area which highlights Chris’ unique skill in being able to transport the reader from the sofa and on to the streets of Gheresk. ‘Like all very good books this one is difficult to pigeonhole into a genre. Is it an Andy McNabesque tale of daring do during the war in Afghanistan? Yes, but it is much, much more. Is it also a sharp history of that war from an insider’s viewpoint? Yes, but that’s far from all. Is it a personal story of family, divorce and despair (AKA midlife crisis). Yes, but… Is it a satire on how politicians give their Armed Forces an impossible job to do and the Armed Forces just get on with it? I could go on, but I won’t. It is obviously all these things. And that is why it is a very good book indeed. ‘This is the first critical account of the UK’s mission in Afghanistan, written from a personal perspective, that I have seen and I found it a surprisingly cathartic read. The author skewers the shortcomings of the misadventure very neatly without letting his criticism turn sour, and the account is framed against his failing marriage which makes an appropriately futile background. ‘This is a cracking read by a bloke who decided it’s never too late to try something different (or in his case to go back to something he’d tried earlier). The well-paced narrative examines the extremely personal decision of the author to give up what many would consider a successful life, in order to pursue adventure whilst in the service of his nation. It consists of twin themes of the examination of this decision and his personal perspective on military misadventure in Afghanistan. For any who had any interest in this confusing theatre of war, it will make uncomfortable reading as no punches are pulled and the stark realities of sending an under-resourced force without any real strategic endstate are laid to bare. However the book is laced with the black humour that has served the British soldier so well over many years and many other seemingly futile escapades, and this ensures a lightened tone. ‘Spin Zhira is a story of perspectives; from a man’s loss of centre in a civilian world to his loss of comrades and sometimes his own truth in a very modern conflict in Afghanistan , Chris shares his journeys through challenge, hope, fear and disillusionment without ever letting us lose sight of the real costs of this war. With the backdrop of his own world forever in the picture, his analysis of the tactical delivery of such a large politically directed campaign has lessons for plenty of organisations outside of the military sphere. There have been many stories of close shaves and lucky escapes, but Chris has kept the bravado to himself and focused on the heroism of others and the lunacy of self-deception which is prevalent through many parts of our society. It is never more poignant than when the cost can be counted in lives, the future of a nation and families separated by cultures, languages and thousands of miles at the hands of RAF hospitality. Chris manages to keep humour a constant thread and reminds us of one of life’s most important lessons. When you have nowhere left to run….. buy a ski pass. If cherry powder doesn’t fix your ills, it’ll get you through. ‘A poignant and moving look at a slice of British military operations in Afghanistan from the perspective of a TA officer of advanced years. For any middle aged man who wonders what to do about his ‘crisis’ this is both a lesson in perhaps what not to do and a call to do something. ‘This is an immensely enjoyable as well as provocative read. On one level,it’s is the story of what leads a middle aged man to give up on a comfy corporate lifestyle ,but as the narrative unfolds Chris’ story raises some serious questions about the ambitions and ultimate goals of our involvement in Afghanistan and the role of spin over substance ….and I thought the spin would characterise his advertising not his military experience.At the heart of the provocativeness is the question – Is it all worth it ? The true substance and honour of soldiering shines through on every page and I was constantly struck by the strength and quality of character in the soldiers of all ranks that Chris comes into contact with.This brings clear focus and rationale for our admiration of the Armed Forces. But above all this is a story of bravery – the bravery to leave a lifestyle that so many aspire to ,the bravery of real armed conflict (as he handles a life and death situation in an overgrown cornfield) and the bravery of standing up to events ,actions and policy decisions that are clearly flawed and just not right. THE BEST MILITARY BOOK I HAVE READ. ‘This true story of a mid life crisis is a superb read. Chris had a life that many can recognise but his mid life crisis was unique! Rather than the fast car and dolly birds, he moved to a canal boat and joined up again to serve in Afghanistan. His story is deeply moving and insightful and gives an honest impression of the lives of our young (and not so young) soldiers, dragged from home to fight a war. I loved the style of his writing and the juxtaposition of his life at war against his other passion on the ski slopes of Europe. ‘I suppose the first thing I’d say about this book is it is absolutely not in the tradition of Bravo Two Zero-type muck ‘n’ bullets memoirs. That’s not to disrespect any of those books but just to say that: even if you wouldn’t normally go near a modern war memoir, you might still consider this. And if you have read a lot of those books, buy this and see how it compares and contrasts. Chris’s life during the period he describes was a strange mixture indeed. A mix of probably common middle age experiences (most notably, the sort of divorce many of us go through but which is nonetheless fascinating in its awfulness) and the most bizarre, almost un-worldly transformation that occurs between a comfortable civilian life and a ‘reboot’ of military service. As well as his own narrative, Chris manages to put us firmly in the shoes of some of his opponents, whose experiences he learned about through his day-to-day duties as a liaison officer. So you get a balanced picture of one of the most unbalanced situations I’ve ever read about, i.e. Afghanistan in the modern era. ‘The backdrop to this account of a reservist officer’s deployment to Afghan, is his own search for himself and the ensuing mid-life crisis. It is at once shocking, exciting, motivating and humbling. The author articulately describes decisions, actions and impulses that reveal in sharp relief, great selfishness and huge selflessness. It is this contradiction which imbued in me, as the reader, great humility, recognising similar traits albeit not as extreme in myself. Ultimately what comes across is the realisation that in order for one’s life to have a meaningful impact on family, friends, colleagues and those of a lesser acquaintance, it should have a foundation of self-esteem. Without it, every interaction is hollow and fragile. Self-esteem allows the maintenance of perspective. At its simplest it enables the author to share the joy of shredding a virgin couloir with lads of a different generation with different values who come together only in the moment. A true story. That’s what the cover states somewhat boldly. Reading through Chris’ account of both the prologue, the deployment and the aftermath I was left pondering about the subtitle. The riveting read took me through the various meanings of the word “true”. According to Merriam Webster, some of the definitions are. Loyal: The tale of personal loyalty within the British Army and the special brand of loyalty within any unit deployed in a hostile environment, is magnificently captured by Chris for example in the vetting process of being accepted with the Grenadiers and later in the different situations in Helmand, where only trust in your comrades will see you through. But most of all it comes across as a tale of a man, who faces the need to be true to himself and his legacy and sense of duty. Just: The different angles displayed in both the flawed local governance and the allied inability to serve any kind of trustworthy justice and thus compelling argument to abandon the Talibs and join sides with the Government of Afghanistan, serve to give a perspective on the difficult nature of both counter-insurgency and nation-building, even if it is only in a small town in Helmand. Truthful: “The first casualty when war comes, is truth” In line with this, several of the storylines take us through alternative versions of truth, from the F3T (you’ll see) to the domestic battlefront of marriage and civvie life. Chris comes through bluntly honest in his plot, but the subtext is apparent throughout the book. Accurate: Is Chris’ account accurate? I’m sure it is by his perspective. But true also translates to narrow, and the story thrives on the accurate perspective laid out before the reader. Although Chris’ has corroborated most of the statements and tries to ensure the reliability, the strong point is the fact, that this is his story, his view and his true experience. ‘Chris Green has written a book based on his experience of Helmand in the summer of 2012. During this period the British Army was in a state of flux, slowly drawing down their presence to leave the Afghan army to fight the Taliban. Unlike other authors Green writes with a surprisingly candid humour about the tour and the actions of those involved. Other books either look at a strategic narrative of the deployments or try and write about the macho fighting but few actually bother to explain what it was like to be out there for such a long time. His hilarious asides about the 20 somethings working in the HQ trying to keep sane, May to some look disrespectful, as at the same time soldiers deployed were fighting and suffering, but the reality was that a group of about 7 people had to plan and order hundreds to action in a very hostile environment and to keep sane they had to laughed, joke and in some cases draw penises on each other’s note books. His description of those higher officers, on whom some significant pressure was applied, really brings home how much those behind the fighting had to take, not a physical threat, but the mental strain of deploying hundreds of soldiers into some difficult tactical situations and knowing that a single mistake in orders or one single slip up in the plan could see men die. ‘An ex army friend of mine recommend Chris’ book to me and to be honest, I found it enthralling. It made me laugh out loud, curse and cry in equal measure. I dropped a star as personally the timeline transitions at the start of they book threw me a bit, but it did not detract from the overall experience. ‘Insightful is the word I use to describe this book. It gives the reader many unique insights about what it means to be a soldier and officer, not just in serving in Afghanistan but in the forces in general. The highs, lows, the good and the bad. It balances informative insight with entertaining flow and narrative. My perspective on our involvement in these conflicts is now much more informed and I will be applying a strong filter to all future media articles. The book is not all about the forces though, as there is also a a great insight into what it means to reach a cross road in your life. What it takes to deal with the choices you’ve made and what needs to be done in order to lead the life you seek. ‘Let soldiers do what soldiers do, and they do it very, very well. Turn soldiers into nation-builders – and ask them to remake that nation in a foreign image – and they do what anyone else would do: they make stuff up. Spin Zhira (an Afghan term for an old wise man) relates the author’s own experiences as an reservist in his 40s who volunteers for service in Helmand Province during the nastier phases of Britain’s most recent military involvement. While stationed in “Communications” (what civilian companies would call PR) his deployment isn’t from far behind the lines; he goes on patrol and, yes, he gets shot at. Green doesn’t paint himself as a hero – in fact, his tone is self-deprecating and full of dark humour, more Spike Milligan than Andy McNab. Possibly the best tone to take when you’re many years older than the guys around you and the gaps in your own military skills are thrown into sharp relief. When talking about his colleagues, the Danes come off well, the Americans slightly less so, and special forces – with whom he has a few run-ins – surprisingly badly. While it’s never stated overtly, the overall take-out is clear: this war was one monumental mistake. While each chapter is very different – the second half of the book, in particular, descends into a VERY dark tone as the author’s frustration with the engagement shares headspace with his personal problems back in the UK – there’s great consistency of theme: cheerful competency on the ground, contrasted by the utter impossibility of the job they’re told to do by their masters. Again and again, the woeful state of Britain’s military preparedness comes across: engines kept together by string and skill, weapons falling somewhat short in the ammo department, clapped-out equipment impeding progress everywhere. And massive, appalling wastes of (British) taxpayer money on “initiatives” whose collective result is to line the pockets of tribal elders. Even worse is the classic groupthink of denial: everyone knows what they’re doing is wrong, everyone knows what should be done, but nobody does it, because nobody else is doing it. I ABSOLUTELY LOVED THE BOOK AND WILL BE READING IT AGAIN AND AGAIN. We met recently at the “Just Add Water” event at the Seven Dials Club where you spoke about your book. I’ve just finished reading it and had to write to tell you how moved I was by your story. You said to me you hoped it would make me laugh as well as cry and it certainly did both, but also evoked lots of other emotions. The poignancy with which you write about your sons is particularly touching and I’m sure they’ll be very proud of their dad when they’re old enough to read and understand the book. You also told me the writing process had been a cathartic experience, but I was struck by your bravery in being so honest about some very personal issues. Without wanting to sound gushing, I have to say I was rather humbled by the whole story and I don’t think I’ll be alone in that. I was also bewildered by the sheer ridiculousness of the bureaucracy you described – having worked, albeit some time ago, within the MoD I thought I had a good handle on this, but your story takes it to another level entirely. There are points in the book where your frustration radiates off the page and I felt both enraged on your behalf and astounded at people’s capacity to bury their heads in the sand and be so unaware of what’s happening around them. As I’m writing this it’s making me think about how many strands and layers there are within your story, so for this reader at least you’ve achieved the writer’s holy grail of provoking thoughts, questions and reflections that will continue long after the last page! ‘Chris deployed with the Grenadier Guards to the Gheresk Region of Helmand Province in 2012 on what turned out to be a very testing tour. Chris was a Reserve Officer attached to the Battalion deploying on what was to be 9 months tour. This could have been a daunting prospect for many however with his sense of humour and approachable and charming nature he fitted in well with not only his fellow Officers but the NCOs and Guardsmen alike. Throughout the tour Chris was employed as the lead influence officer, a task that in itself required the qualities displayed by Chris as well as a whole lot of patience and tolerance ! This is no holds barred account of Chris’s tour, which is undoubtedly the best book I have read on the recent Afghanistan ‘era’ due to the candidness of his account. ‘Before going on, I will say that this is the best book by a soldier concerning the Afghan War that I have read. The only criticism I would have is that it is not hard enough on the institutional dishonesty of senior officers. It is all too easy to accept, because that is the way we are trained to think, that it is acceptable to be less than honest in order to get promotions; it is ‘understandable’. I disagree; it is not ‘understandable’ in the context either of preserving military discipline or as part of military culture that we place lipstick on a pig. This is done, as is clear from Spin Zhira, at the cost of people’s lives. All that said, this was a great read. I was fascinated to compare my own experience as a reservist with his; I had no training or preparation for a fairly demanding tour of Iraq in a similar role; it is encouraging to see that this has emphatically changed. It is also very refreshing to get some criticism, and some detail, of the destructive arrogance of special forces, who were at least as clueless as the rest of the army. We also get detail about his personal life, which gives depth to the rest of his account which is brutally honest, both about Chris’ supposed shortcomings and more pointedly, those of the mission itself. It would be difficult to come to any other conclusion that the Helmand campaign was misconceived, pointless and unwinnable. Chris is clear that the soldiers were, in the final analysis, fighting only for each other – but isn’t that always the case?. Alfie and I make the front page of The Times today. Apparently Alfie’s application for enlistment into the Reserves has been delayed by red tape.